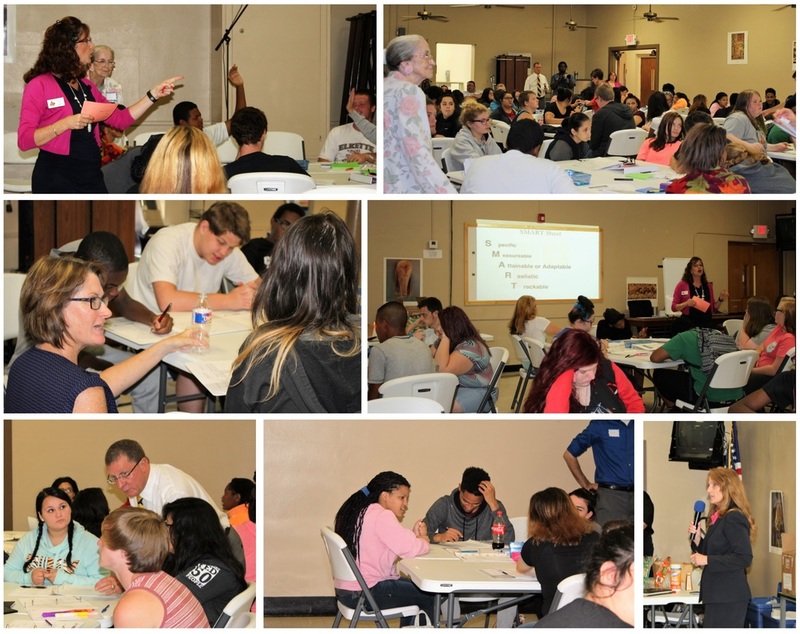 James Taylor, program manager for Oklahoma Employment Security Commission (pictured helping students, bottom left), said the series was created as a result of asking Lawton employers what their greatest challenges in finding employees are. "They said, among today's youth, it's a lack of soft skills -- coming to work on time, putting in a full day's work, knowing how to dress properly or communicate with their supervisor," he explained. "So we have a team of professionals here today that have backgrounds and interest in supporting our future workforce. We can provide them tools they can use in their goal of becoming gainfully employed and keeping a job." After last year's kickoff workshop in May, Taylor said LPS students returned positive feedback on the event and were interested in continuing participation in the series. Community leaders -- representatives from banks, institutions and local businesses -- then joined forces to plan the next "Show Me in the $$" workshop, which would consist of a "theoretical session" and a "specific skills session." The program is an extension of Gov. Mary Fallin's Oklahoma Works state workforce initiative. "Our goal is to get a group of business leaders from Lawton and first put them at the middle school level to get the students to start thinking about their future goals and careers," Taylor said. "That's our ultimate goal." In addition to the Oklahoma Employment Security Commission and Lawton Public Schools, partners and sponsors to the program include the Lawton-Fort Sill Chamber of Commerce, the OSU Extension of Comanche County, White Buffalo Restaurant, Skills for L.I.F.E. Foundation and Artes pro Vita Academy. Coordinators are currently reaching out to staff from Eisenhower High School and Lawton High School to discuss involving more LPS students.